One year after Superstorm Sandy hit the eastern United States, local, state, and federal agencies as well as community groups and businesses are working to strengthen the U.S.s resilience to future disasters. A National Research Council (NRC) has issues a series of studies and reports, and has put together workshops and study groups, which should advance the national conversation on preparedness and resilience. One year after Superstorm Sandy hit the eastern United States, local, state, and federal agencies as well as community groups and businesses are working to strengthen the U.S.s resilience to future disasters. A National Research Council (NRC) release notes that the NRC has issues a series of studies and reports, and has put together workshops and study groups, which should advance the national conversation on preparedness and resilience. 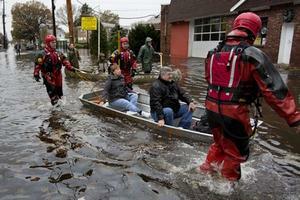 Disaster Resilience in America: Launching a National Discussion. The 2012 report Disaster Resilience: A National Imperative was released just months before Sandy hit and launched a series of discussions around the country about community resilience. The year-long activities were bookended by workshops at the National Academy of Sciences (NAS). Full Webcasts and video interviews with the participants are available online. The Resilience of the Electric Power Delivery System in Response to Terrorism and Natural Disasters. Following the 2012 Research Council report Terrorism and the Electric Power Delivery System, this workshop summary expands the discussion of vulnerabilities to the electric grid to include natural disasters. The National Research Council’s Disaster Roundtable facilitates the exchange of ideas on a variety of topics related to disasters and resilience. Koshland Science Museum will host an event on 16 November for families to participate in hands-on activities, meet disaster experts and emergency responders, and learn how to build a more resilient community. With the increasing frequency of natural and human-induced disasters and the increasing magnitude of their consequences, a clear need exists for governments and communities to become more resilient. The National Research Council’s 2012 report Disaster Resilience: A National Imperative addressed the importance of resilience, discussed different challenges and approaches for building resilience, and outlined steps for implementing resilience efforts in communities and within government. Launching a National Conversation on Disaster Resilience in America is a summary of a one-day event in November 2012 to formally launch a national conversation on resilience. Nationally-recognized experts in disaster resilience met to discuss developing a culture of resilience, implementing resilience, and understanding federal perspectives about resilience.